In one scene of the movie - taking place in an Indian Maharaja's place - a sumptuous banquet is laid out. The first course is a coiled python, with a surprise. As you cut open the snake, smaller snakes (snakelets?) slither out and Indian royals greedily put them in their mouths. This is followed by some sort of caramelised bugs and the dessert is chilled money brains served in what looks like monkey heads. When the American heroine asks for something simple like soup, bloody eyeballs stare back from the pink liquid. As I understand, Indiana Jones and the Temple of Doom was banned in India at the time of release and even during the shooting, the then government refused permission unless they read the script and/or the right to censor scenes shot in India. After seeing the banquet scene described above, I could see why. Nothing justifies a ban of a book or movie but this scene comes as close to justifying a ban as any. Even if we discount the blithe stereotyping, Temple of Doom is a rather slow and boring film by Indiana Jones standards. The opening sequence is chaotic (as it should be) but not thrilling. And it is completely devoid of reason, which is different from all the other films because they lay down a suitably outlandish reason for the archaeologist to get involved into the mayhem in the first place. The thrills can be seen from a mile away and the usual gross-out-with-creepy-crawlies technique is so badly overdone that it grates after a point. The climax is way too long and, except for a collapsing bridge sequence, seems rather boring. The one bright spot in the film is Amrish Puri. Amrish-ji brings the best of Bollywood OTT dramatics into play and reduces Harrison Ford into a sweaty wimp. 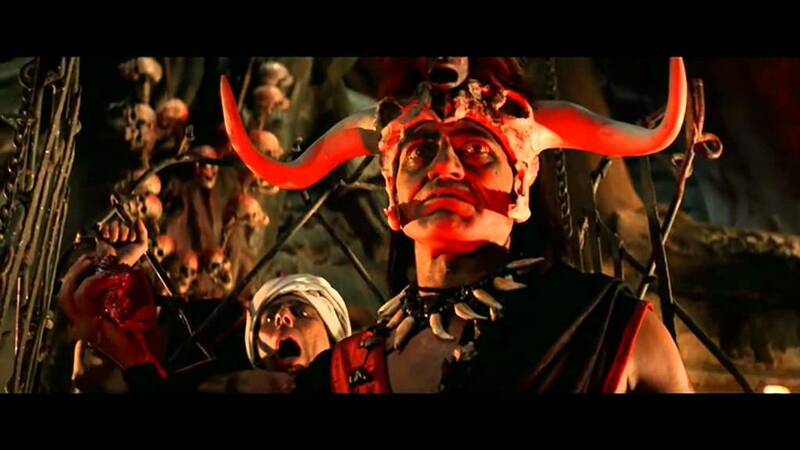 His Mola Ram is deliciously evil and when he bulges his eyes and utters the cult "Kaali, mujhe shakti de... tere aage bali chadhaoon..." lines, you cannot but cheer him on. Amrish Puri is tall - but only by Indian standards - but in most scenes, he seems like a hulking presence eminently capable of ripping everyone's hearts out with his bare hands. It just shows how a good actor can lift a mediocre script and get all eyes to be trained on him despite the presence of bigger stars. After the film, Spielberg said, "Amrish is my favorite villain—the best the world has ever produced and ever will!” I concur wholeheartedly and can only wonder why he didn't manage to get a thriving career as a villain in Hollywood. 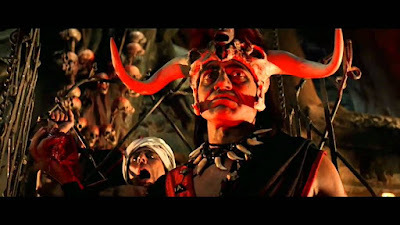 Frivolous Footnote: Mola Ram's headgear seems to have been reused by Kabir Bedi in Mohenjo Daro while his red vat of acid/fire was later borrowed by Mogambo! You could say Temple of Doom has contributed a fair bit to Indian cinema. For more trivia on the film, check this out. New Generation Care FoundationCentre or Nasha Mukti Kendra in Delhi was started behind the goal to assertion occurring people who are struggling subsequent to substance abuse. At Rama Rehab we have helped many shackle addicts & their families in last 15 years.